Candy Cottage, you might have suspected, would take you to Hansel & Gretel’s adventure to the Gingerbread House. 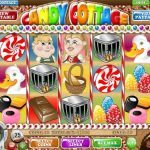 Unlike H&G you can win prizes for finding all sorts of candy and characters while also enjoying tons of options for bonus games like free spins, expanding furnaces and a Cage Bonus. 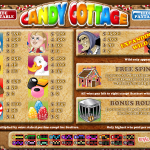 There are about 800 different line, coin and coin value combinations so this game will be enjoyed by all slots gamers. 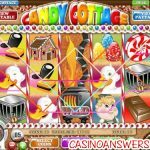 The Gingerbread House – 3 or more of will trigger the Free Spins bonus of 10 spins where all prizes you win will be tripled. The Cage is used by the witch to lock up children but when you get 3 of them you trigger the release of Hansel and you get a bonus round where Hansel gets to catch a variety of candy that gets you cash! Apart from that Hensel & Gretel also pay a hefty cash prizes. when you get 2, 3, 4 or 5 of either you get 2, 20, 150 and 750 coins respectively. If you like the Brothers Grimm and Hensel & Gretel tale then this game is for you because it fully captures the essence of the tale in its animation, graphics and music. Also, the free spins feature is fairly easy to trigger and the game has a very generous RTP! Not to mention that your teeth will say thank-you because you get cash and not real candy! Love 5 reel slots? Try Blazin Buffalo, a 5 reel slot by Rival.